Last year’s class of prospects delivered one of the best rookie campaigns, Evan Engram, by a tight end in a decade. Furthermore, fellow first-rounders, O.J. Howard and David Njoku, illustrated their long-term fantasy potential while George Kittle also flashed enticing abilities. Unfortunately, the Class of 2018 does not offer a generational player worthy of a first-round selection in the Draft like last April. The top three prospects are all valued as second rounders; however, a team might reach for one of the players early. There is depth and talent at the position. 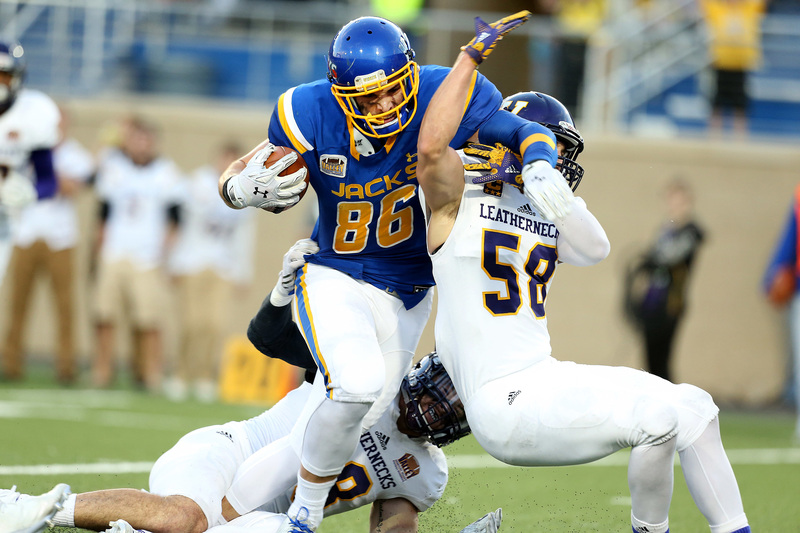 Dallas Goedert and Mike Gesicki provide tantalizing pass-catching abilities while Hayden Hurst and Mark Andrews might be gobbled up by the end of the second day of the annual allocation of college talent. With the escalation of the multi-dimensional, game-breaking tight end in recent years, scouts and personnel offices have changed the skill-set paradigm of the position. Front offices seek the next phenomenal power forward playmaker who can govern the middle of the gridiron and defeat Cover 2 defenses down the seam. One-dimensional blockers, who are essentially sixth offensive linemen, are late-round fliers or priority free agents in the modern game. Listed below are profiles of the top tight ends as well as their benchmark stats in order to assist diehards like myself in pinpointing future NFL stars. Took the path less travelled to NFL prospect: Walked on with the Jackrabbits and finally earned a scholarship. A multi-sport athlete as a child: track, ice skating, skiing and basketball. Wanted to play basketball in high school. Recorded back-to-back 1,000-yard seasons: 92-1,293-11 (’16) and 72-1,111-7 (’17). In 2017, Walter Camp FCS All-America Team. During career, scored 22 touchdowns and totaled 2,988 yards. Last two seasons, accumulated an incredible percentage of team’s passing yards: 33.9% (2016) & 30.2% (2017). In 2016, produced five catches for 96 yards and a touchdown against Big 12 opponent TCU. Physical skill set and trustworthy ball skills at 6-foot-5 and 255 pounds. Body control and footwork of a much smaller player. Exceptional pass catcher with huge hands and large-catch radius. Amazing, one-handed high-light touchdown versus Drake. Employed as traditional TE, in the slot and off-set position. Athletic “move” tight end: Very dangerous weapon in RPOs. After the catch, heads upfield and gains yards. Coaches rave about his football IQ. Willing blocker who will earn playing time as a rookie. A raw prospect from the FCS level, but well worthy of a top selection in April. Incredible Combine performance pinpoints an elite athlete: Tremendous scores in the vertical jump (41.5) and broad jump (10’9”). Stupendous Senior Bowl week. Established Penn State career records for tight ends with 129 catches, 1,481 yards and 15 touchdowns. Set single-season school marks for the position with 679 receiving yards (2016) and touchdowns with nine (2017). First Team All-Big Ten and one of three finalists for the John Mackey Award last year. Concluded campus tenure with a catch in 27 consecutive games. Former basketball and volleyball player: Earned Division I scholarships in both sports. High school slam-dunk champion. At 6-foot-5 and 247 pounds, long-and-lanky competitor who profiles as a power forward. Nimble athlete with great hand-eye coordination, body control and flexibility. Freakish pass catcher with loose hips, long legs, sure hands, large catch radius and fluid athleticism. Gains easy separation and makes difficult catches. High points the ball well with terrific leaping ability. Savvy route runner who glides off the line and employs head fakes to confuse opponents. Tracks the ball and challenges the seam of the defense. Unusual acceleration for a long-limbed runner. Lacks strength and bulk to be a full-time, in-line blocker. Lined up mostly flexed outside of formation. Might be propelled into the late first round by a playoff team. Former MLB player in the Pirate’s organization. In 2012, graduated high school and in the summer of 2015, walked onto the Gamecocks. Will be 25 when the NFL season kicks off in September. Team Captain in 2016 and 2017 and First Team All-SEC last year. In 2017, earned Unselfish Teammate Award. Played wide receiver as a freshman at South Carolina. At 6-foot-4 and 250 pounds, excellent athlete with a prototypical frame. Natural, reliable and soft hands. Tough competitor who breaks tackles and accumulates YAC numbers. Versatile player: employed in-line, slot and at fullback. Runs well and easily changes directions. Good body control and snatches passes with large catch radius. Fearless in the middle of the defense. Smooth acceleration and gets open versus man and zone coverage. Mature young man. Needs to improve route running and footwork. Limited route tree in offense. Can be pushed while run blocking and needs to gain strength. Raw prospect whose draft value will vary among personnel departments because of age. 2017 John Mackey Award winner and First Team All-America after catching 62 passes for 958 yards and eight touchdowns. At 6-foot-5 and 256 pounds, a big, flexible, fast and agile athlete with broad shoulders. Played wide receiver in high school. Good footwork, balance and change of direction skills. Mismatch for defensive backs with large frame and catch radius. Advanced pass catcher with soft hands to make difficult catches. Adjusts to the ball well: Elastic enough to corral both high and low throws. Good initial quickness and uses hands to separate. Fights for the football and snatches throws in congested matchups. Good release at the line of scrimmage. Very good short and intermediate target. Nice run-after-the-catch ability. A fine red zone threat and challenges secondaries down the seam of the defense. Employed in the slot and out wide of the formation. Type 1 Diabetic: A manageable condition with diet and medication. A little stiff of an athlete and occasionally places the pigskin on the ground. Willing but average run blocker: Not a foundational in-line tight end and is not a road grader. Projects as an H-back and interchangeable/move player. Draft stock may hinge on a club’s analysis of run blocking potential. Former walk-on who earned scholarship. Second Team All-America, Second Team All-Big Ten and Team Captain last year. In 2016, Goodyear Cotton Bowl Classic Offensive MVP and Second Team All-Big 10. In school history, finished seventh in career receptions and thirteenth in receiving yards with 1,627. Led Badgers in receptions with 93 for 1,126 yards and six touchdowns during past two seasons. Played in pro-style offense: Knowledge of NFL schemes and concepts. At 6-foot-5 and 247 pounds, two-way tight end. Nice combination of size, length and hands. Very good run blocker and sure-handed pass catcher. Lined up in backfield and employed as a road grader through traffic. While blocking, effectively uses angles and churns legs until whistle blows. Adjusts well to poorly thrown balls with good body control. Savvy route runner who creates separation. Locates soft spots in zones and great at corralling football in traffic. Understands coverage and discipline footwork in and out of breaks. Dependable target, hard worker and high football IQ. Missing index finger after surgery as a baby. Not an explosive athlete and lacks speed. Needs to gain weight and strength. A good value on day three of the Draft.